Background: Many journals have book reviews. However, in the sciences the most common form of communication is not books, which are out of date when published, but articles. Many books are based on articles and enlarged often beyond what is required. However, the opposite is also true: there are many important articles which address basic issues in the social sciences that have not been made into books, but perhaps should be. In order to draw attention to important articles which address basic issues which sociologists are interested in, Sociation Today will review articles rather than books. Our second review article deals with the core concept of how density affects the human animal . The author of the article finds a J-curve or non-linear relationship. At very low density levels, increased population density lowers costs of providing services such as police protection. But beyond very low levels of density, as density goes up, so do costs to government. Rapid population growth also imposes costs on the local population through lower service levels. Population Growth, Density and the Costs of Providing Public Services, by Helen F. Ladd in Urban Studies, Vol. 29, No. 2, 1992, pp. 273-295. One of the oldest hypotheses in the social sciences is that population density plays a vital role in explaining human behavior. Following authors such as Louis Wirth (1938) and other work known as the Chicago School, basic theory holds that as population density increases, stress on the human animal will also increase. Manifestations of this include increased levels of social disorder compared to less dense areas. One measurement of this would be recorded crime levels. As the population of the United States and indeed the world as a whole continues to concentrate in cities, local governments have taken a keen interest in how to pay for the urban overheads necessary to accommodate the continued concentration of the human population in urban areas. The costs of providing police services is one area of interest, as are ways of controlling the costs of urban overheads. A starting point for Ladd (p. 273) "...is the observation that we know very little about the average effects of population growth on local public sector spending." Since the county boundaries of the USA are fixed, as population increases, so does population density. But does increased population density increase or decrease costs? Ladd (p. 274) finds there are two opposite forces at work here. "On the one hand, higher density is likely to increase per capita spending as more services, such as refuse collection, must be provided." More people might increase the harshness of the environment by increasing crime which would increase public safety costs. But most planners argue that increased population density is good because "there are economies of density in the production of certain services (p. 274)." High density planned development is supposed result in significant savings to government by reducing both the capital and operating costs of police, fire and solid waste collection and disposal services and storm sewers, according to The Real Estate Research Corporation (1974) and Downing and Gustely (1977). Fixed costs spread over a larger number of people, it might be argued, would lower the per capita costs of public services. To test the actual results of population density on public services, Ladd looks at data for 247 large counties in 1985 covering 59 per cent of the population of the United States. 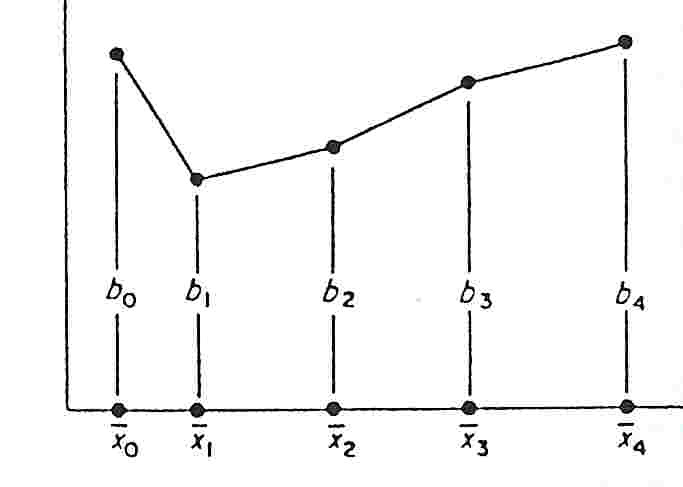 Piecewise linear regression is used for analysis (see Figure 1). Piecewise linear regression assumes a straight line relationship only between any two points (example b1 and b2), but does not assume that overall a relationship must be linear. The result shown in Figure 1 is a J curve, or a non-linear relationship. Thus at very low levels of density, for example, population density (the X axis) can show a decrease in public safety spending. But at higher levels, the costs show an increase. To avoid a simplistic analysis, Ladd uses many different measures in her article as controls. Expenditure variables include spending on current operations, per capita; spending on public safety, per capita; and capital outlays, per capita 1978. Demand cost and taste variables are: income, per capita; residential share of accessed value of property tax base, 1986; manufacturing wage rate (by state); public school enrollments, per capita; fraction of population below poverty level, 1979; manufacturing employment per resident; non-manufacturing jobs per resident; crime rate; population; percentage of population more than 12 years of education, 1980. Intergovernmental relation variables are ratio of local direct general expenditure to state and local direct general expenditure in the county's state; ratio of local spending on public safety to state and local spending on public safety in the county's state; federal aid, per capita; state aid, per capita. Regional dummy variables are East, Midwest, South and West. Density variables are given the following cutting points of people per square mile: 0; 250; 500; 1250; 1750; 24,000; or as an alternative 750; 1000; 1500; and 24,000. Population change variables are also included. Population growth does not pay for itself. Ladd finds that "...the major stress on local public spending associated with a surge in population occurs in the capital, not the current, account budget (p. 288)." However, as density increases, capital outlays also increase. The same is true for public safety spending. Population loss costs money, but so does growth at all levels. More interesting, population density shows a J-shaped relationship. Only at very low levels of density are costs high, and decline until population reaches about 250 persons per square mile (see Table 1). Once the population reaches 250 per square mile any increase in density results in higher per capita costs for public safety. (As a reference point, Ladd notes that Wake County, North Carolina, which includes Raleigh, has an average density of 414 persons per square mile.) Regionally spending on public safety is lower in the East, Midwest and South than in the West. Although the results are non-linear, Ladd's findings are not hard to interpret. Those who feel that increasing population density will decrease costs to local governments are correct, but only at very low levels of population density. "The increasing per capita spending as the density of counties rises above 250 people per square mile provides important evidence to counter the view, which emerges from engineering and planning studies, that higher density reduces public sector costs (pp. 291-292)." For most situations, more population density equals MORE per capita costs to government. Of course, the normative question of whether it (growth) should be asked to pay its way in order to hold harmless established residents is a different question, and one that is beyond the scope of this paper. One should note, however, that to the extent that the fiscal burden on established residents arises because of the higher overall density in the county, it is hard to make an economic argument for high financing burdens on new residents alone; after all, the established residents are as much a cause of the higher density as are the new residents (p. 293). More broadly stated, the issues raised by Ladd are important from a social justice point of view. Should new families buying their first house pay, for example, a school impact fee? Is this not just a quiet way of charging young families tuition for public education, a fee not charged to existing residents? The 2000 census shows that more and more people in the United States are moving into a few areas of increased population concentrations as the rural economy continues its historic decline. Population concentration, not sprawl, will continue to be a major social factor in the coming years. And as the one industrial nation with substantial population growth, it is quite clear that increased costs of public services which happen with growth and increased population density will continue to be widely discussed. Downing, P.B. and Gustley, R. D. (1977). "The Public Service Costs of Alternative Development Patterns: A Review of the Evidence." In P. B. Downing (Ed.) Local Services Pricing Policies and Their Effect on Urban Spatial Structures. Vancover: University of British Columbia Press. Real Estate Research Corporation (1974). The Costs of Sprawl: Environmental and Economic costs of Alternative Residential Development Patterns at the Urban Fringe.. Washington, DC: USGPO. Wirth, Louis  1969. "Urbanism as a Way of Life." In Classic Essays on the Culture of Cities, ed. Richard Sennett. New York: Appleton-Centry-Crofts: Pp. 67-83.